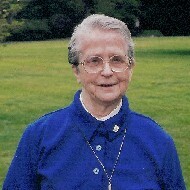 Sister Fabiola Loignon, known as Sister Mary Consolata smsm, died on the feast of the Ascension at Bethany Health Care Centre in Framingham, MA (USA), on May 1, 2008 after a long illness. Sister was born on January 22, 1914 in Providence, Rhode Island. She was the daughter of Joseph Loignon and Joanna Paquin. She had three brothers and three sisters. All of them predeceased her. 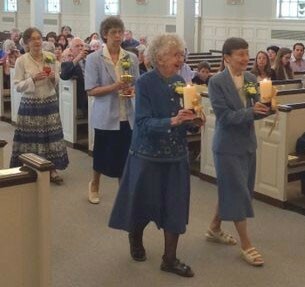 She leaves behind many nieces, nephews, grandnieces and grandnephews, many friends and her loving community of Marist Missionary Sisters. 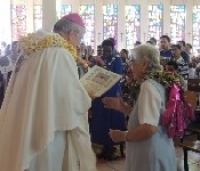 She is also remembered with affection and prayer by the people of Samoa where she served on mission for forty-five years. Sister entered the Marist Missionary Sisters on September 8, 1932 in Bedford, MA. She was professed on September 8, 1934 and received her assignment for Samoa on October 16, 1934. The departure ceremony took place at the cathedral in Boston by Father Cushing. It was a time of sadness and anticipation as six missionaries said goodbye to family and friends before catching a train bound for California. This was a five-day trip with only one stop in Chicago along the way. 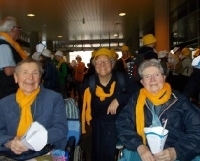 The sisters carried enough sandwiches for the trip to the West Coast. From California they boarded a small ship, the SS Mariposa, for their destination in American Samoa that was then a United States naval base. From here Sister Mary Consolata travelled on a small boat to a mission in Western Samoa where throughout the trip she sat or slept on mats that covered the engine hatch. For a twenty year old this was sister’s first introduction to life as a missionary. Her career as a teacher began the day after her arrival in Western Samoa when she immediately had to replace a teacher who was sick. With the help of her sisters she gathered some teaching aides and learned a few Samoan words that would get her started. She immediately established a warm and caring relationship with her students and often said that she was learning with them. It was only in 1958 when she was asked to teach high school that she had an opportunity to go for Teachers’ Training, at Loreto Hall, New Zealand for studies. 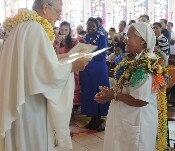 In 1981 after spending forty-seven years in Samoa, Sister returned to the United States. This was a big adjustment for her as she tried to adapt to a culture that was so different from the one she left in 1934. It did not take long for her to find ways to serve others in her homeland. She took the CCD Master Teachers’ Program after which she taught CCD at Sacred Heart Church in Waltham, MA. She worked there for ten years and helped develop the outstanding Religious Education Program they have today. She also volunteered her services at Maristhill Nursing Home where she worked in the Occupational Therapy Department and spent time with the residents listening to their stories. 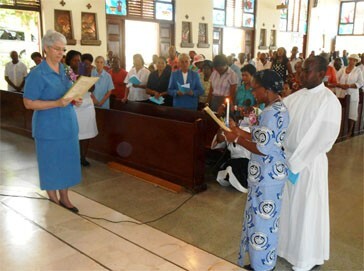 A Mass of Resurrection was held at the Sisters Chapel on May 7. 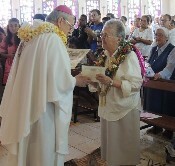 Many messages were read from her beloved people from Samoa offering their prayers and expressing their love and admiration for sister who had become part of their lives.